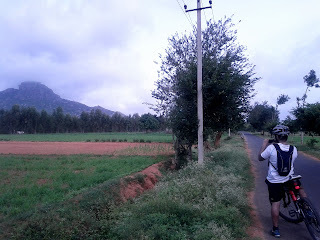 This morning, some ex-colleagues and I did a 100 km biking ride to Shivagange, a hill situated off NH4 towards Tumkur. The highlight of the trip was the first leg of the return journey when RD-man and I put in a burst that lasted 1hr 45 mins in which we covered almost 40 kms without a stop, on some beautiful stretches of country roads. That feeling of "getting in the zone", I think, is what makes cycling so addictive. pix plz? and would like to know what was fed to the tiring body at the end of the 100 kms?